Migrants help economies to thrive. So why do they still generate fear? Yesterday was International Migrants Day. Quite rightly, the international headlines continued to focus on the stalled evacuation of civilians from Aleppo; and many of the events marking International Migrants Day renewed attention on the ongoing refugee crisis in Europe. 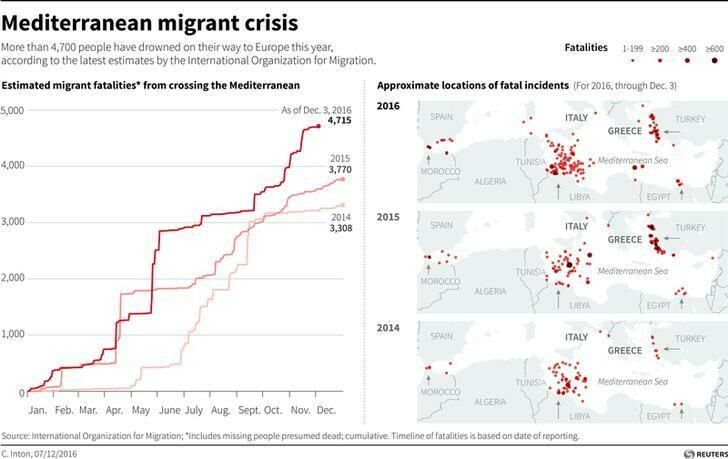 And certainly there is a crisis – at least 4,000 people have drowned in the Mediterranean this year, a record high. Still, Europe’s crisis should not distract from a far greater refugee crisis unfolding in Turkey, Jordan, and Lebanon, sub-Saharan Africa, and South Asia. Neither should we forget the far greater number of people who have left their homes as migrants – almost 1 in every 33 people in the world today - moving largely in search of work. A significant proportion of these migrants are also vulnerable, such as those without legal status, the victims of migrant smuggling and human trafficking, and unaccompanied minors. And migrants have been insulted and derided by both electioneers and electorate in the UK and USA this year. But this isn’t a competition for compassion. International Migrants Day is instead intended to celebrate migration; and there is much to celebrate. In countries around the world, highly-skilled migrants continue to drive innovation and enterprise; and the less-skilled to fill critical shortages in the labour market. The evidence is clear that overall migrants employ more people than they put out of work; pay more into the welfare system than they take out; and create new markets for national industry. It is no wonder that almost every business leader willing to speak out opposed Brexit. Migrants have also become the main driver for development. The World Bank estimates that between them they may send home as much as $600 billion this year – at least three times the value of all foreign aid. Development experts agree that remittances will play a critical role in funding the Sustainable Development Goals. And beyond their economic and development impact, migrants also generate the diversity on which multicultural societies, global cities, and contemporary culture thrives. But they also generate fear. International Migrants Day may be a day to celebrate migration, but it should not be a day for complacency. There are genuine concerns that in some municipalities, and even countries, the number of migrants is too high. A mounting xenophobia has its complex roots in the inequalities of globalization, the legacy of the global financial crisis, and a visceral uneasiness and misunderstanding of Islam. Some migrants have conspired to or carried out terrorist acts this year; more are criminals; and more still are exploiting the welfare state. Integration remains a challenge. Surely one of the lessons of the past year is that, sympathize or not, we ignore such concerns at our peril. Refugees and migration will be high on the agenda at the upcoming World Economic Forum’s Annual Meeting in Davos. Refugees will be a significant focus for the next two years for the Global Future Council on the Future of the Humanitarian System, under the towering leadership of Queen Rania of Jordan and ICRC President Peter Maurer. The Global Future Council on Migration, which I co-chair with Canadian Senator Ratna Omidvar, will support this work on refugees, but also strive to ensure that migration also remains a focus for the World Economic Forum. This is because the World Economic Forum has the potential to fill three critical gaps in the international system on migration. The first is the lack of political and institutional patience to endure the short term challenges of migration in order to realize its longer term benefits. The second is the lack of space for an objective debate that does not crystallize around pro-migration and anti-migration poles. The third is the lack of a systematic opportunity to bring together all the various people who can help improve migration outcomes and perceptions – governments, municipalities, civil society, the private sector, the media, and migrants themselves. We have the opportunity in Davos to ensure that the cautious celebration of migrants and migration extends beyond just one day.